Budgies are easily entertained with colorful and shiny objects. 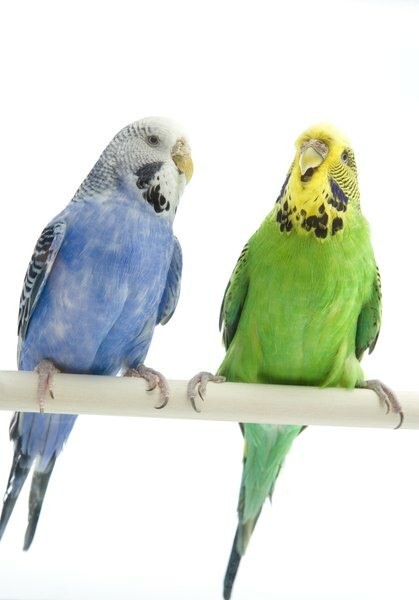 Budgies, also known as parakeets, are a good first pet choice. If they have ample water and nutritious food, as well as space to stretch out, their basic needs are met. The addition of toys and perches encourages both physical and mental activity, making their cage interesting and fun. Consider the environment outside your budgie's cage as well as the inside. Place the cage on a level surface, against a wall, and elevated on a table or shelf to provide a sense of security to your bird. Keep the cage away from extreme temperature and humidity changes, such as found in the kitchen or bathroom. 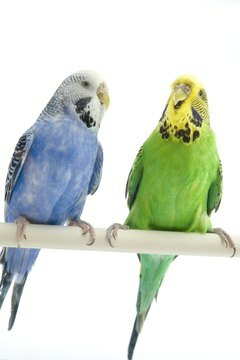 Choose a cage that is wider than it is tall to accommodate your budgie's movements. A cage that is 12 inches wide can accommodate up to two budgies. Place at least three feeding cups in the cage. These will hold water, food pellets or seeds, and bits of fruits and vegetables. It is important to wash the feeding cups regularly to avoid buildup of bacteria; daily is recommended by the Association of Avian Veterinarians. Group the cups together, or separated on different sides of the cage for multiple birds. Provide perches for your budgie in addition to the plastic pieces attached to most cages. Add twigs or sticks, ropes or wooden dowels at different levels within the cage to provide various heights for your budgie. Rotate different bird toys into the cage each week. Bells, bird "gyms," mirrors and shiny objects keep your budgie from getting bored; attach the objects in different places around the cage to encourage movement and curiosity. For safety reasons, avoid toys made with treated wood, glue or small parts that the bird can swallow (such as beads). Check perches and toys frequently. Replace damaged pieces at once to avoid a possible choking hazard. Avoid keeping your budgie's cage near anything that could be toxic, including cleaning solutions and air fresheners of any kind. Does a Toy Poodle Need High Protein?